Thursday night 10th July was the Dearnford Lake Relay event with a great turnout for Helsby to challenge some of the top Cheshire clubs. Each team consisted of 3 legs each of 2 miles as a relay. There were 24 out in the green vest and some very admirable performances too. There were over 110 teams out in total so it shows how well Helsby did on the night. Lots of stats to work through at the link below for those interested in times. Teams and placings published below with an individuals time next to their name. Helsby ladies had three of the top ten fastest lap times on the night with Jayne Joy the 2nd fastest lady. Colin Bishop was in the top ten for male lap times. Well done to everyone on the night and a fantastic event to highlight the success and potential of Helsby RC. Thanks to Joe and anyone else who was out for your fantastic support on the night. Also on Thursday was the Wizard 5miler, a multi-terrain race in Cheshire that forms part of the Cheshire Road Race Grand Prix where John Thompson ran “the tough multi-terrain race through the woods, fields and hills around Alderley Edge” to secure 156th place in 40.59. Delamere Park Run on Saturday 12th July saw a good turnout for Helsby with a good win for Colin Bishop for 1st overall. Well done to Phil Gillard for his new PB as well as Joanne Lacking and Emma Barnes. Joanne was first lady home for Helsby. There was also a Helsby victory at the Warrington Park Run 5k on Saturday for Colin Thompson who secured a new PB in a fantastic performance as did Shan McCarthy for 1st Helsby lady home. Sunday saw the We Love Manchester 10k where sole representative for Helsby was Roy Gaskill securing 69th overall. “It started and finished in Deepdale near Patterdale with the entire race wedged between Ullswater and Thirlmere on the Helvellyn range. The weather was perfect for the race, it started hot on Saturday morning but gradually clouded over and became thankfully cooler. Rain started the moment we got to the overnight camp site at Wythburn at the head of Thirlmere but only became heavy as everyone was tucked into their tents sleeping. It was cloudy and misty first thing on Sunday but cleared as we climbed up and was sunny but cool for the rest of the day. All courses were really tough and much harder than normal due to this years new planner being an ex OMM planner. Chris B-H did the individual Klets course (the most difficult one) and came in an excellent 6th place in a total of 10hrs 12m . Well done Chris. Jackie, Rachel, Lesley & Sally entered the paired event of Kirkfell (mid difficulty) but ran around altogether for moral support in a total time of 15hrs 19min to finish 52/53rd out of 56 finishers, however 22 did not finish due to the severe course which made us feel much better on our position. We were just delighted to finish it in once piece, still speaking to each other and with our sense of humours in tact! highlight of my year. 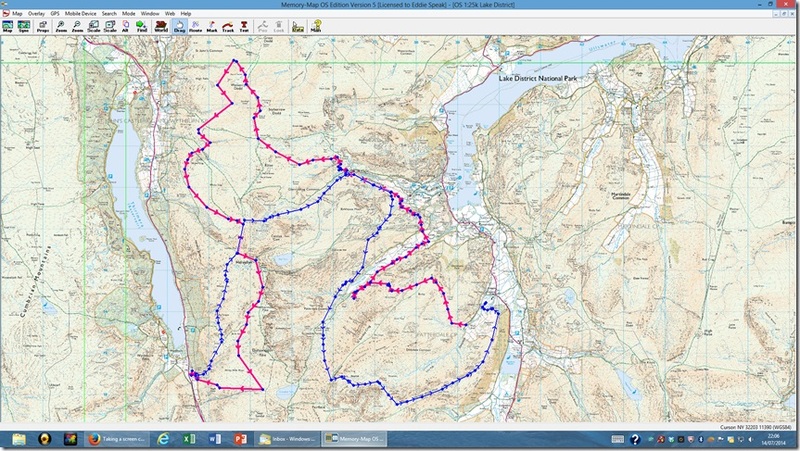 For those not familiar with the mountain marathon format its essentially orienteering on a grand scale over rough open fell land. I took on the solo ‘klets’ class which meant I’m given a map, a series of grid references and I have to decide which order I take them in. Strategy, accurate navigation and light kit are the key elements to success; Sadly the strategy and accurate navigation bits aren’t my strengths! Starting off we managed to get a group helsby photo before heading our separate ways. I started well speed wise, but badly in the accuracy stakes over shooting by 400m. It doesn’t sound a lot, but its adding the best part of 1k to my run and in this terrain that’s a large addition in such a tight event. before calling it a night. heading to Grizedale tarn and making a poor decision. With my ankle very sore I thought I’d go over Fairfield rather than around it. I lost time and ultimately didn’t manage to pick up any places, but I didn’t lose any either so finished in 6th overall. Considering my aim was to try and break into the top 10 I was over the moon! As always please let me know of any other events I may have missed as I can always update the blog. Wednesday 23rd July its the 6th fell counter Green Green Grass of home, a steep fell race of 4.5 miles and 1500ft climbing from Llangynhafel. Wedneday 29th July, in the clubhouse after our club run, Jayne Joy will be giving a talk on Eating Disorders in Sport, chip butties provided!! Please come along to the third in our series of club talks on running related subjects. This entry was posted in Fell Running, Road Running, Trail Running and tagged Dearnford Lake Relays, Delamere Park Run, Saunders Lakeland Marathon, Warrington Park Run, we love manchester 10k. Bookmark the permalink.